I was reading an article in CFO.com, titled Services With A (CFO) Smile. It was about revenue streams. It got me thinking. I cannot remember when a conversation has ever ensued that discussed revenue streams in this context. 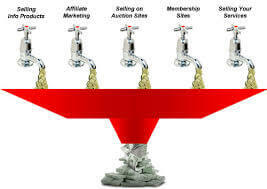 The differentiation of products and services to obtain revenue at different points in the fiscal year. Now we have discussed new products and new business lines including acquisitions and strategic partnerships as ways of growing sales. However, the fact that these new lines may or may not have different cycles never came up. Maximizing our productivity of the different components of the company, was also never in the mix. Obviously if you can keep productivity near 100% daily, you will have reaped full benefit of fixed assets and expenses, as well as employees. Logically, if that increased productivity worked its way to sales (revenues), the bottom line would also show improvement. Along the way, most of the KPIs dealing with utilization of expenses and assets would improve. EBITDA would go up. Everyone would be happy. As the article points out, services is a tough repeatable sell in many respects. For the sake of the argument I am not talking about subscription models for SAAS based software. While repeatable sales can be tough, many sectors provide a service and have a longer life (multiple year renewals) or just required. An example would be your base accounting system that would normally not change for multiple years given the costs to change that base system. On the other side is obtaining a secure certificate for your internet server/domain. While you may change vendors, you would be buying the certificate (vendor changes in my opinion do not happen that often). So one needs to find a service that would complement your business model that could be offered to your (potential) customers to increase sales by cross- or up- selling. Gets you thinking, doesn’t it!